HONG KONG: GRAPPA’S RISTORANTE @ AIRPORT | Beverly's Net: family. food. fashion. HONG KONG: GRAPPA’S RISTORANTE @ AIRPORT – Beverly's Net: family. food. fashion. Decided to have lunch at the airport before my Hong Kong –> Singapore flight, as for some reason I was stupid and forgot that I’d be served lunch too on the plane. Nevermind, 2 lunches for me can’t go wrong! Figured I’d try out some Italian food, since we don’t eat that often in Shanghai. Grappa’s Ristorante looked promising and popular enough, so decided to chill out whilst waiting for my flight. It’s situated in the middle of the airport, overlooking the check in counters. The pianist on the baby grand is a nice touch, and service is attentive and polite. I settled on the Osso buco alla milanese – braised shank of veal with tomatoes, celery, carrot and natural juice served on a bed of saffron risotto because I just can’t say no to the word “shank” once I see it on the menu. Sadly, the veal came out dry – the edges showed that the meat was evidenty cooked beforehand and left in the fridge, so the surface dried out. They did pour sauce on top to try and mask that, but didn’t cover all the meat 😉 I know this paints a pretty dismal picture, but frankly, I’m pretty sure most restaurants reheat a lot of dishes on their menu. It was actually not too bad. Some parts were tougher, but some were tender and was nice when dunked in the gravy. Still, I wouldn’t order it again since now I know it’s not cooked fresh to order 😉 The Saffron risotto, however, was obviously freshly cooked and was awesome! Cookies brought back for Mum, Dad and I. I liked the Banana one! And so, with that, I said Bon Voyage to Hong Kong and Salutations to Singapore! 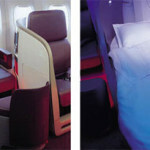 did you take business class back?? SQ’s? Yeah, but it was Cathay pacific, the service there is superb! ah i see, CX’s economy class is quite crap. but the food is decent.